My name is Bob and I am the lead trader behind 1000pip Builder. I am an experienced investment professional and have advised clients from all over the world. I now want to make the trades taken on my own account available to a new set of investors who want to succeed at the Forex market. This is a unique opportunity to join a professional trader and follow the trades taken on my own fund. 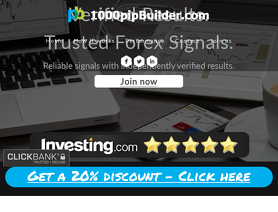 Here at 1000pip builder, we want to make Forex trading easy for our members. We do all the complex analytics that successful Forex trading requires and whenever a trade is taken on our fund we instantly send you an email and SMS with all the important details. We include entry price, stop loss and take profit level, so you can be sure that you can follow exactly what we're doing. FIrst-Rate Signals. I can't wait for the live trading room. I have been with 1000pip Builder since 2017. There is no hype or get-rich-quick scheme, everything is transparent. Bob is very helpful and has done his time trading in the city. Currently, his signals have proven reliable for the long term trader. One this Bob has been promising for a while is to open a live trading room and provide videos on his strategy. I would love for him to do this so that I can learn to trade like him and interact with other traders. He said he would be starting this in 2019 so hopefully, we will get the full package soon. Worth paying, great signals. It does not matter the amount of signal but the quality of them. 1000 pip builder is an amazing signal provider i highly suggest using it!! This service, is the only signal provider i tried that is really good. For months i wasted too time testing other signal providers, and nothing. I tried so many for so long and i couldn't be able to make money...The ones i tried don't really work as explained. But i try 1000 pip builder and i see my MT4 account grow from the signals they send. Using the signals they send I increased my account %10 in a few days. The email and text message signals are really stable and the delay is minimal. All this is and they are very approachable and help my with my risks management. Hi It's been over 4 weeks since I subscribed to Bob's 1000 pips builder service. I am disappointed with his signals, Firstly I gave him the benefit of the doubt when as I was only been with him for 2 months, however the next two months I didn't see a improvement at all. I sent my screen shots to prove the trades, but he came challenging stating his system had made money?? this was quite baffling as even after I have sent my screenshots of trades that have been taken. I started my subscription last Monday but there were no signals until the Tuesday. First trade came through around 1pm GMT and by 5pm I had made +63 pips profit. Great start. I have accumulated over 230 pips over 8 trades (I think) from the signals. I could not be more pleased. Some signal made a loss but net result is in profit. The signals are reliable and profitable. I recommend this service. Consistency in winning trades is important, and this service provides that. I had very good experience with this guys and I can recommend it to anyone. They go for trade with high probability not just for any trade. As a member of his signal service, he knows how to trade forex. I like his mid-term trading setup. Signals have yielded good results so far. SMS come most days with a few signals and my account has steady grown over the month or so that I have used it. The pip total has not been huge but the consistency of results has impressed me very much.